The red wrapping was secured with a long strap of sticky tape. I dug a nail in under a corner and as i peeled it off, the paper tore down the middle and uncovered my present inside. I lifted the snow dome up for a closer look and saw a mum and dad and a kid making sandcastles in the sand. Lexie’s dad always promised her that one day they would go to Surfer’s paradise. Now that he’s gone, Lexie dreams of the day she will still get there. But living in the commission with her mostly absent mother, Surfer’s Paradise seems a long way away. Then Lexie witnesses something shocking and finds herself befriending a man everyone calls Creeper. Lexie and her friend Davey help the man they soon learn is called Mr Romanov and together the three set off on a journey that will change their lives. Mr Romanov’s Garden in the Sky is a moving tale of an unlikely friendship. With some quite shocking scenes and a range of issues, including drug abuse, bereavement and dementia, the story could be overwhelming, but a blend of humour, action and empathy makes for a satisfying blend for younger teens. in and out, in and out. She looked just like a little girl. Poor Mama must be very tires. I know! thought Hattie. I will help out. It’s Dad’s birthday and Mum is getting everything ready for the party – with help from Hattie. But when Mum says it’s time for Hattie’s nap, Hattie isn’t keen. She convinces Mum to lie down with her and she doesn’t fall asleep – but Mum does. So Hattie decides that it’s up to her to help out and get everything ready for the party. 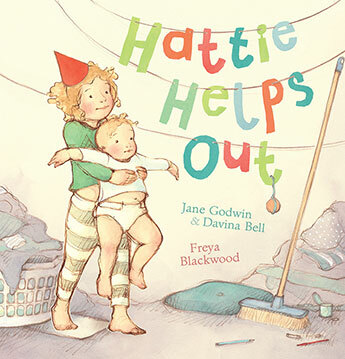 Hattie Helps Out is a gently funny story about growing up, being helpful and families. When Hattie tries to help, not everything goes the way it should – she sticks the biscuits together with stickytape (instead of icing), puts flowers in odd places all around the house and hides the mess wherever she can manage. But she does it with love – and that is how it is received by the extended family when they arrive, and Mum when she wakes up. The water colour and pencil illustrations by Freya Blackwood bring the family to life, with the rough outlines giving a gentle quality. Hattie Helps Out will make adult and child readers alike smile. It is a pleasure to welcome Alison Reynolds to the blog today. Alison is here to introduce us to her two new books, which sound absolutely wonderful. Welcome Alison! I was commissioned to write a book about manners subtly hidden in a picture book. About 9 months. I feel as if I’ve given birth to twins! The illustrations! I love them. That it is possible to have a message and a story without being didactic. Also, sometimes it is possible to break the rules. These books are over the customary 500 word rule for picture books. Dinner at favourite Italian restaurant. I’m having a colouring competition and another competition for adults beginning Thursday 15th October. There are a few ideas floating around for picture books, and I’ve got the first page and outline of a historical YA. Thanks so much for visiting, Alison. The books look divine. Jake’s birthday was just around the corner. Every morning, the big day had crept a little closer. One day, Jake was counting the number of sleeps left to go when his father asked him a question. Not just any question – a BIG question. Jake liked birthdays. He liked feeling special. He liked being older. He liked the cake Nana made him. When Dad asks him what he would like for his birthday, he decides to write a list of the things he’d really like. Everyone seems to think he has everything, but Jake knows that’s not true. His list includes his own beach and unmelting snow, a pirate and a cheetah. His birthday grows nearer and the list grows longer. He has no real expectation that he will get anything on his list but he’s determined to make sure he doesn’t get any more boring presents. Jake’s Aunt Lyn just might have the answer. There are no page numbers in Jake’s Gigantic List, and illustrations on each page. The story is divided into short chapters. Jake’s Gigantic List is a first chapter book for newly independent readers. Jake’s list is an exercise in imagination. If there were no limits, money-wise or other-wise, what would you wish for. Readers will develop their own lists of imaginary presents, no doubt wilder and wilder. Aunt Lyn though offers Jake access to all that his imagination can dream up to list, and then some more. ‘Jake’s Gigantic List’ is written in third person, allowing easy access to the story for new readers. Boys, particularly those who find books daunting, will enjoy this book. So will every reader who likes lists and birthdays! Recommended for newly independent readers transitioning from picture books to chapter books. Jimmy isn’t coming to my birthday party. He’s working at his family’s restaurant. His Dad is having an operation. And Rosa isn’t coming either. A small boy is having a birthday party. Invitations have been given to many children, but one by one, the invitees decline. Some of the responses seem genuine, others have the sound of excuses. But the boy doesn’t mind. Each page shows a child doing what they’ve said they’ll be doing rather than attending the boy’s party. But of course the illustrations show so much more. Jimmy, who has to work in his family’s restaurant may be carrying crockery, but there’s a cake missing and his cheeks are bulging. But no matter, the main character is unfazed by their inability to attend. None of these children, singly or as a group can do the things that he can do with his best friend Georgie. Not Like Georgie is less a story about a birthday party and excuses and more about friendship. Not the ‘everybody is your friend’ kind of friendship, but the special best-friendship that can make the simplest things seem wonderful. It is the triumph of quality over quantity. Anticipation about whether Georgie too will offer an excuse and not come to the party, keeps the pages turning, lest the boy have no one at his party at all. Children will also enjoy the humour and detail in each image. The illustrators have captured so much emotion, personality and more in each character – even the sun-shading seagulls have personality! Recommended for 4-7 year olds.